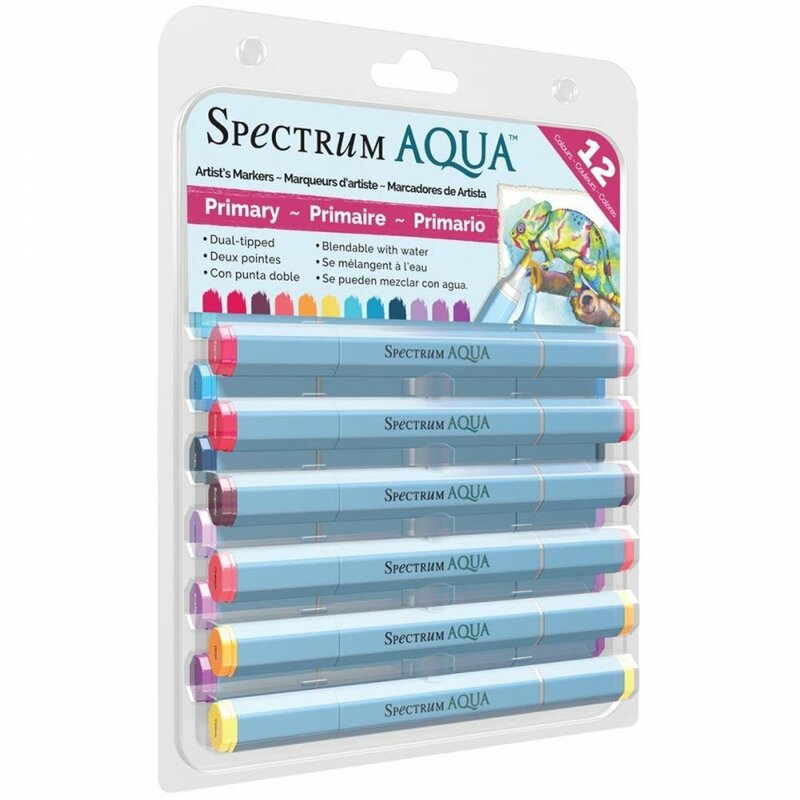 Spectrum Aqua is the water-based artist’s marker that goes wherever your creativity takes you. From sketching and illustration… to layout and design… to Manga and comic art... and paper-crafts too. Whatever your style, Spectrum Aqua combines the performance of water-based colour medium with the easy to use convenience of a marker – to give you outstanding colour results. There are 48 colours available, split into four colour-themed packs of twelve. Each Spectrum Aqua Marker is dual-tipped, there's a soft brush nib for flexible line control and a more natural art surface feel and at the other a precise fine tip for definition and accurate line work. Spectrum Aqua is a great addition to conventional water-based paints and other colour media. Its high quality dyes give flawless, even coverage with all the definition and vibrancy you need. Then using water you can diffuse and seamlessly blend colour to create the lifelike tones and subtle touches that will bring added depth and realism to your work. Spectrum Aqua is great for layout and design work, making it handy tool for students. Enhance your portfolio with hand drawn renders, working alongside paints, pencils and other design media or if your colouring just for fun, Spectrum Aqua's clean colours and easy handling are ideally suited to Manga and comic artwork - from big, bold heroes to more refined, subtle characters. You can use Spectrum Aqua on crafting projects too - for stamped designs with an alternative, more delicate water-coloured look or for producing beautiful washes and background effects. Spectrum aqua pens blend well with the use of a wet brush, you can create stunning background wash effects adding as much or less colour as preferred. The beautiful quality is being water based markers there is no bleed through unlike alcohol markers. The marker pens are available in a range of beautiful colours.